Personal Details: Frederick Sampson Jeffery was born 7th March 1891 in Gladstone; he was one of two children born to Robert Joseph and Selina (nee Sampson) Jeffery. His mother died when Frederick was 11 years old and his father remarried and had two more sons. Frederick was a student at Kadina School until he won a full scholarship to Prince Alfred College in 1905 until he graduated in December 1907. He sat for the Higher Public Examination and obtained passes in English Literature, Latin, German and Inorganic Chemistry. He was also a member of the Prince Alfred College Cadets for two years. In January 1908 he began as a Pupil Teacher at Wallaroo, and then transferred in 1909 to Solomontown. In 1911 & 1912 he did his teacher training at the University Training College. From January 1913 until April 1914 he was Assistant Teacher in Charge at Riverton District High School. 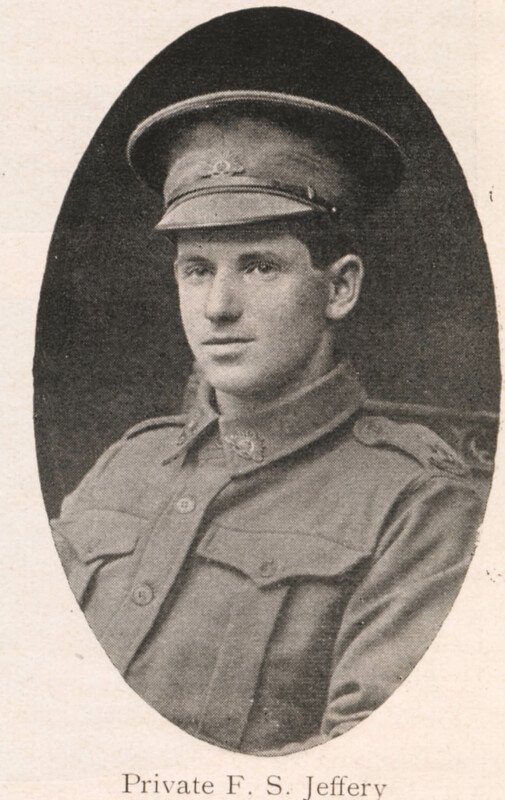 He then transferred to Blumberg District High School on the 12th April 1914 until he joined up in April 1915. He was given leave from teaching from the ‘4th April 1915 until the return of the Expeditionary Force’. The School inspector reports record very high praise for his teaching skills. He was a member of the Blumberg Rifle Club for nine months. Details of his role in the war: Frederick enlisted on the 9th of April 1915 and was with ‘C’ Company Base Infantry until he joined the 8th Reinforcement 10th Infantry Battalion on 12th May 1915. He embarked from Adelaide on HMAT Anchises on 2nd September 1915. On 27th November he was taken on strength in Mudros and disembarked the Seay Bee in Alexandria on 29th December 1915. On the 27th March 1916 he proceeded to join the BEF at Alexandria and disembarked at Marseilles on the 3rd April 1916. He was killed in action in the field on 23rd July 1916; he was one of the first Australian casualties of the fierce fighting at Pozieres. He has no known grave and is remembered on the wall of the Australian National Memorial at Villers-Bretonneux in France. Flags are flying at half-mast today on account of the news that has just come through that Private F.S. Jeffery has been killed in action in France. At the time of Private Jeffery’s enlistment he was high school teacher at Blumberg, and was deservedly popular not only with the high school scholars but with all the townfolk. He was prominent in all public matters and was on the committee of the institute. Mr. Jeffery was also secretary and treasurer of the football club. He enlisted from her in April 1915, in the famous 10th Infantry Battalion. He was transferred to France from Egypt early in March. Much sympathy is felt for his parents who reside in Port Pirie. From the Adelaide Advertiser 18th September 1916 is the following article which gives a wonderful insight into his sense of humour. "We have been now for several weeks in the trenches, and so far I have been successful in 'dodging the souvenirs' from our friends over the way. Apart from the rain, which is pretty constant in this part of the world, the firing line is not a bad place, considering. I am writing this from within a dugout, which I share with another chap, one of the Mitchells, from Pirie. It is 4 ft. 'by 6 ft. and 3 ft. high, so you can understand that there's not a superabundance of space. We have a horde of rats and mice billeted upon us. The dugouts often have nameplates over their doors, the names varying with the humor of the occupants. Some go in for flash designations, such as 'Vice Regal Lodge' and "Marble Hall.' Others are ironical - 'Dreamland,' "The Abode of Peace.' 'Home for the Weary' and 'Benevolent Home for Waifs and Strays.' And there are dozens such as 'Sacco' Homan's Retreat,' 'Do-Drop Inn,' 'Our Wurlie,' etc. Before I came here I had a small dugout of my own, which I carefully cleaned up, carpeted with sandbags, and furnished with odd rails and shelves, and, finally named 'The Hermitage.' The same afternoon there was a bombardment, and when I returned to my abode, lo! It was not, for a shell took it. According to the custom, I put up a 'To Let' notice and em-shied (Arabic, as commonly used by our fellows, for 'Nicked off'). "Our fare in the trenches is not too bad, but you sometimes see a humorous notice like this on the parapet-'Soldiers are kindly requested not to eat the sandbags." There's not much that happens from which the fellows don't extract some humor. For instance, a chap may be enlarging on his plans for spending his furlough in England when it comes. One of his pals near him will generally act the 'cheer up' and remind him that he’ll probably be busy 'pushing up daisies' long before then. By the-way, real daisies are growing right up to within a few yards of the firing line and in 'No Man's Land.' It's surprising how soon Nature hides the destruction caused by the war. Most of the churches I've seen since coming to France (we've been here nearly three months, most of the time in the district formerly held by the Germans when they made their great offensive in 1914) have been wholly or partly destroyed by the enemy. You can understand how the French must hate their enemies for this as much as anything because their churches are invariably splendid buildings, often hundreds of years old, beautifully kept and ornamented within, and they really form in many ways the central point of the people's lives. I've been putting in at French. It's surprising how soon one is able to make oneself understood. The folk are always willing to help us in our efforts to learn the language."